TOKYO - Nikon Corporation is pleased to announce the release of the AF-S NIKKOR 400mm F/2.8E FL ED VR, a super-telephoto, fixed focal length (prime) lens with a focal length of 400mm and maximum aperture of f/2.8 compatible with Nikon FX-format digital SLR cameras, and the AF-S TELECONVERTER TC-14E III, a 1.4x teleconverter with a new optical design, which is capable of rendering performance close to that of the master lens at maximum aperture. The AF-S NIKKOR 400mm F/2.8E FL ED VR is a fast, 400mm super-telephoto lens for which fluorite lens elements (2), ED lens elements (2), and Nano Crystal Coat have been adopted for superior optical performance. In addition to the fluorite lens elements, components made of a magnesium alloy have been adopted for the barrel to make the lens lighter, while a tripod collar ring utilizing bearings ensures smooth transitioning between horizontal and vertical shooting, as well as greater durability. The AF-S NIKKOR 400mm F/2.8E FL ED VR is also equipped with an electro-magnetic aperture mechanism that contributes to better auto-exposure stability with high-speed continuous shooting, and a vibration reduction (VR) function that offers compensation for camera shake equivalent to a 4.0-stop* increase in shutter speed. What's more, the lens is equipped with a SPORT vibration reduction mode optimized for tracking subjects exhibiting intense movement that can be predicted, such as athletes participating in sporting events, by compensating only for camera shake. The AF-S NIKKOR 400mm F/2.8E FL ED VR is a lens that responds to the demands of professional photographers who demand the ability to capture decisive moments with on-site sports and press photography. In addition, meniscus protective glass with a fluorine coat, produced using a process exclusive to Nikon for greater durability and superior resistance to water and oils, has been adopted for the extreme front lens element. *NORMAL mode; measured in accordance with CIPA standards. 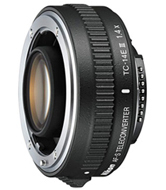 The AF-S TELECONVERTER TC-14E III is a 1.4x teleconverter with a new optical design that enables rendering performance close to that of the master lens with shooting at maximum aperture. The same fluorine coat used for the AF-S NIKKOR 400mm F/2.8E FL ED VR has also been adopted for the extreme front and rear lens surfaces.